A very interesting looking wordpress theme! As the name suggests the Smilies Army wordpress theme has a huge header that features a beautiful graphical design of a small battalion of cool looking 3D smilies on a white background. The shadow effect of the smilies in the graphical image is added to give it a realistic look. The header of the theme also has a search area on the extreme right of the header above the sidebar. Aligned at the bottom of the header is a traditional looking navigation bar of grey color. 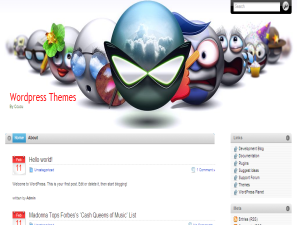 The complete wordpress theme is designed on a white background with colorful smilies and some grey matter in the titles. This is a two columned fixed width wordpress theme featuring a huge content area and a distinct sidebar. The sidebar titles are grey in color and thus contrast with the background. The sidebar titles are soft edged and comprise of links to the recently updated posts. This wordpress theme was designed by Ccucu. The preserver of health is an authentic looking wordpress theme based on an orange yellow striped pattern as the base. The theme mainly focuses on the health care regimes such as dieting. The theme has a large header that comprises of yellow and shades of orange with the graphical design of a circular pattern of different laers comprising of different shades of orange. The graphical design also comprises of a girl sipping healthy juices and a few pieces of orange. Thus, the theme largely focuses on the health related matters and regimes. The preserver of health theme has a white based content area and an orange colored sidebar. The sidebar of the theme is distinct and has a shade darker from the base of the theme with black colored fonts. The sidebar has links for the various posts, comments and articles posted on the blog. This theme was designed and created by designed.nu. A very eye catching bright colored wordpress theme with has a bright color scheme of tomato red and black color. It is a fixed width two columned theme with a sensuous black colored header that displays a graphic design of a beautiful woman with red and white design. It displays your website’s name in bright red color. The sidebar of the theme is completely red in color and has white, black and brown colored sidebar titles and links. The content area of the theme is completely black with white colored contrasting font color. The content area displays the latest posts and comments posted to the website by the readers. This theme has been designed by webhostingrally.com. A sweet looking two columned fixed width theme with a unique contrast of green, blue and white. The background of the content area and the sidebar is white in color while the header of the theme has blue color with the cartoon bunnies in it. The header has graphical designs of green grass with flowers in it. The theme has a complete background of blue colored pattern. The sidebar has the links of the latest updates and the various categories. The content area has a vast space for the display of the latest articles, posts or comments. This theme was designed by designed.nu.